Frazer notes that all primitive magic is founded on a single principle called Sympathetic Magic. Sympathetic Magic is based on the assertion that things act on each other at a distance through a spiritual sympathy, or connection. In contagious magic sympathy is implied between a thing and its part, or between two objects that have had contact with each other at one time. Thus a person may be affected by action upon separated blood, hair, teeth, or nails, personal possessions, immediate family members, even by their own shadow, reflection, footprint or name. Homeopathic magic uses imitation to work its effect. The magician may imitate the subject he aims to act upon or he may imitate the effect he desires, or both. Thus a magician might injure or destroy an image of his enemy in order to harm him. Frazer distinguishes this positive kind of magic, or sorcery, from negative magic, or taboo, which prohibits the primitive person from doing certain things that resemble undesired effects. Thus certain plants and animals, which are endowed with undesirable qualities, are avoided as food. Early man generally considered gods to be sentient, human-like beings with super-human powers, invisible, yet in charge of governing the universe according to prescribed laws. Each god ruled over a particular part of the universe, such as heaven, earth, water, fire, various geologic and climatic forces of nature, livestock and crops, love and war, government and health, etc. These gods are thus analogous to the angels, spirits or “daemons” of the occultist, which indeed often proceeded from the ancient theology. 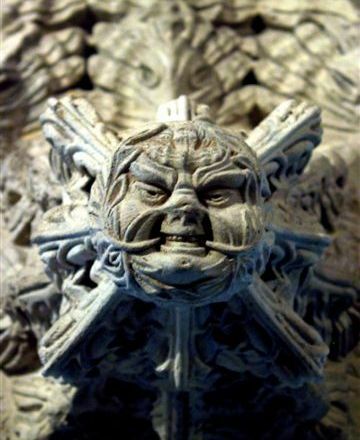 It is common knowledge that before the Communist revolution, a Chinese alchemical Daoist monastery’s main income often came from exorcisms or displays of marvels, although the recluses viewed these duties as a tiresome inconvenience. 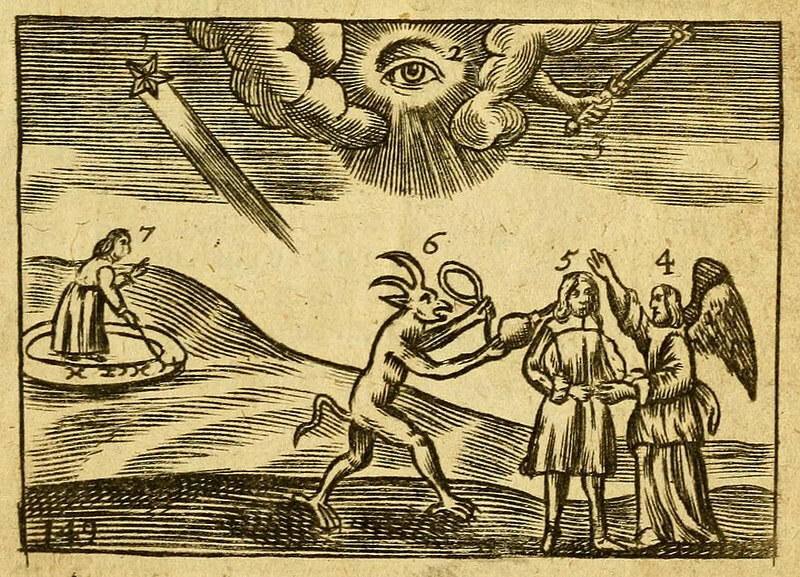 Evoking demons has been known to have been done anciently, but only very rarely. Some demons are self-existing entities, others are creations of the mind. The former may be given sacrifices, the latter are simply destructive tools of magicians, and must be killed by the stroke of a sword. There are Daoist alchemist tree spirits, ghosts, fox-spirits and gods, of varying benevolence and malevolence. These entities, gods or daemons, have often in human history been invoked and evoked to assist the mortal. The psychoanalyst invokes the gods in therapy as archetypes, models or epitomes of personalities or parts of character. This is meant to eventually lead the subject to self-actualization through alchemical isolation of the Prime Matter and the union of the macrocosmic and microcosmic archetypes in the Chymical Wedding. A comparison of early cultures reveals a universal belief in the existence and benevolence of a fertility spirit or god that created and ordered the heavens and the earth. Most often the good spirit was imagined as a male deity, the Father and King, who brought sun and rain (thunder and lightning) to produce the harvest, and fire to give heat, light, and protection in the night. He was the producer and sustainer of life, who made livestock and humans fertile, as well as crops. He was the provider and protector during the hunt, raid or battle, who bestowed wisdom upon the people. This entity, diverse as his attributes have been throughout history and various cultures, is archetypal, and he will hereafter be referred to as the Paternal Deity. In Royal Art Society ritual the Paternal Deity is represented as the Immortal Emperor. His counterpart was the good Mother Earth or Mother Nature who also represented the power of fertility, often governing the hearth and home and assisting during pregnancy and childbirth. Some peoples attributed all of their circumstances to a single entity, be it a monotheistic or polytheistic god. They imagined themselves punished for their own evil when misfortune betook them, and rewarded for good at their good fortune. They saw day and night as contrary phases of the same cycle, and likewise did they conceive of the seasons. Perhaps, like the sages, they conceived of the world or universe as a continuous whole wherein good and evil are subjective reflections upon natural phenomena not universally benevolent or malevolent, but only so from the human perspective. In many cultures, however, the public did not see the necessity or justification of the totality of nature; to oppose the benevolent Paternal Deity was the malignant evil spirit or god. The evil one was the cold and dark night, the death of the sun; he was winter, the death of the crops, and he was illness, death, and misfortune, in general among people and their possessions. The Paternal Deity was compelled or petitioned and then praised for his blessings while the Evil Deity was banished and cursed for his interference. Conceptions of the spirit have always been diverse. Physical bodies may be conceived of as being mere manifestations of immortal spirits, or gods. Thus gods are simply the forces and elements of nature; Apollo is the sun, Ceres is the corn, Dionysus the vine, etc. Anytime the sun gave way to night, or autumn with its harvest of crops gave way to winter, the light and the crops were resurrected in the morning and the spring, respectively, due to the immortality of the god associated with them. This conception is not essentially anthropomorphic: the gods are identified directly with the thing they represent. But it may become anthropomorphic when personal names are given to the gods and images that personify the gods are used as symbols to signify them. Gods might also be separate from their charges, rulers over them that live disembodied in an ethereal place unavailable to mortals; the Greek Mount Olympus was home of the gods, notably Zeus the father of the gods who ruled heaven and earth; the Judeo-Christian Heaven, home to Yaweh the Father and Lord, and the Nordic Asgard, home of father Odin and the other gods. Ancient man theorized not only invisible beings associated with the elements and forces of nature in general, they were interested in particular objects, as well. Many ancient peoples imagined invisible living beings inhabiting each of the different forms they saw in nature. They imagined an astral double dwelling within every lake, mountain, stone, tree, animal, and person. The spirit might share the shape of the physical body it is clothed in or it might take the shape of an animal, person, or imaginary being. The spirit may be considered to exist outside of its physical form, as in the case of gods who ruled over the elements or sometimes the souls of people. The soul of a person could leave through the mouth or nostrils and cause dream, trance, illness or death. It might escape during sleep or a sneeze or yawn, or it might be stolen by a ghost, a magician, or a demon or devil. A soul or the souls of an entire family might be stored in some sacred object like a plant, tree, or animal, to keep them safe. The magician is sometimes a king or priest, and sometimes he or she is considered a criminal or an outcaste. In ancient times the magician practiced his magic publicly for the welfare of his community. His people depended on him for the very maintenance of life; he was to control the sun, the rain, and the success of his community in every endeavor. His position afforded him power and influence among his people, giving him a leading role in the religious and political life of mankind. The medicine men or priests were historically the first and earliest chiefs or kings of ancient tribes. One who became chief or king through heroism, inheritance, or other circumstances, was expected to perform magical duties. In time, as medical, spiritual and political duties became more complex and time consuming, the head office was divided between the three functions. Those who had been victorious in battle took over political sovereignty, those more spiritually inclined learned and developed the religious discipline of the community, and the more scientific-minded adopted the rigors of medicine. Various societies grew to have either priestly-kings with war veteran advisors, or warrior kings with spiritual advisors. To understand the natural relationship between Church and State it is necessary here to briefly discuss early conceptions of monarchy, of succession, of evil, and of the function of blood sacrifice in human society. 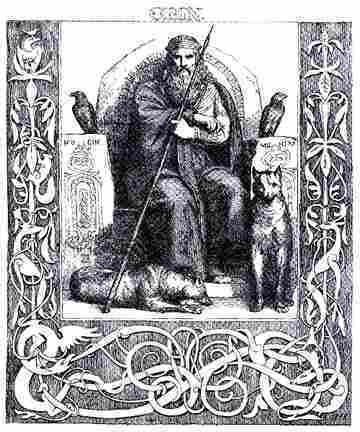 As far in the past as human memory and resource has the power to penetrate the earliest magician-king had been chosen to rule due to his descent from a yet more ancient magician or god. As ghosts of dead rivals haunted early man, and were warded off with rituals, spells and talismans, the spirits of his ancestors watched over him and received his veneration. The Paternal Deity produced the royal line in most cultures, but the minor gods had their share of offspring with mortal maidens. It was common in the early history of man for an unmarried woman, who was by strict custom a virgin, to explain her pregnancy by the polite excuse of divine conception. The ancient world was in no short supply of so conceived demi-gods, as many primitive kings claimed descent from such unions. To trace their ancestors to the Greek heroes of divine descent, both the Roman poet Virgil and the British historian Geoffrey of Monmouth contrive royal blood connections through Aeneas, a legendary prince of Troy who fled to Italy after the Trojan War. The immortal Paternal Deity is supposed to share his soul with his descendants, the family of chieftainship or line of royalty. He is the archetype for his successors. Likewise, the wife of the king often was the embodiment of the tribal goddess. Royalty could thus claim divinity through their bloodlines. Indeed, as gods are nothing more than the perceived forces of nature, and the leaders of men are incontestably natural forces, it is not presumption or vanity to recognize the divinity of the government. The king is a god not less or more than sun, rain, sky or earth. Spirits are interpreted differently by different cultures, for example, as Daoist gods and spirits, Chinese internal organs or life functions, as the Egyptian and Greco-Roman gods, the Jinni or genies of Islam, the Catholic Patron Saints, or Goetic and Enochian spirits. The “Shemhamphorash” of the Goetia of The Lesser of Solomon the King is a list of seventy-two spirits with various powers. These spirits are, in part, forces in nature which may be perceived, and in part, “portions of the human brain,” as the philosopher magus Aleister Crowley conjectured in The Initiated Interpretation of Ceremonial Magic (1904). To veil such things in darkness, out of the application of science, is wrong. It is an illusion, this division between science and spirit. Thus the knowledge must be gathered into one book, the spirits revealed as energy, as forces, and the methods discovered scientifically. Spirit is often, but not always, sought in stillness and silence. One method of dwelling in the spirit involves meditating by following the breaths to the source of life. The Zen Buddhist doctrine of the void interprets “voidness” as a state of mind and being. The void is prajna, or transcendental wisdom. The authors of the Diamond Sutra insisted on the importance of the cultivation of prajna or void at the cost of total silence and stillness. This doctrine refutes the Chinese Daoist method of just sitting as worthless quietism. To the Daoist alchemist the “Three Treasures,” Jing, Qi, and Shen, each represent a kind of spirit. The practice of Daoist alchemy begins with self-restraint, moderation and stillness. The alchemist learns to control the heart, the seat of fire, that it may not be stirred by the seven emotions: pleasure, anger, sorrow, joy, love, hate, desire; or the five thieves: eye, ear, nose, tongue, body. This is the foundation of the preservation and growth of jing, or generative force, which is dispersed by the senses and emotions. 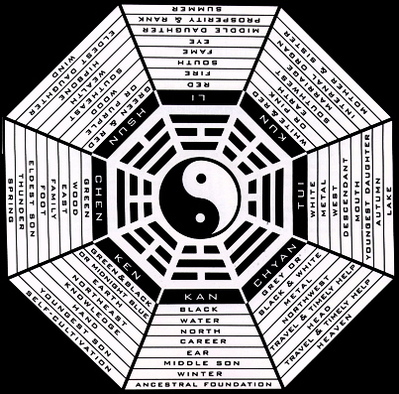 According to the second chapter of the Daode jing, the One gives birth to the two (yin and yang), the two to the three (jing, qi, shen), and the three to the 10,000 things (an archaic Chinese term for the totality of all things in the universe.) Cultivating the Three Treasures thus leads to Daoist Immortality. Cultivating jing, or essence, leads to a store of generative energy. Cultivating qi, life-force or vitality, leads to the realization of eternal life. Cultivating shen, or spirit, leads to the realization of essential nature; No-mind or Samadhi. In the Hebrew Torah, the words of Moses describe God’s creation of heaven and earth from void, “Darkness over the surface of the deep” with the ruach, translated as “wind”, “spirit”, or “breath” of God “Sweeping over the water.” The Christian term for ruach is Holy Ghost or Holy Spirit, the English “spirit” deriving from spiritus, the Latin for “breath.” This is usually considered to be distinct from the human soul. “Soul,” describes simply the functions of the mind, or the whole person itself, as distinct from the spirit, the conjectured active spark of life within all living things. 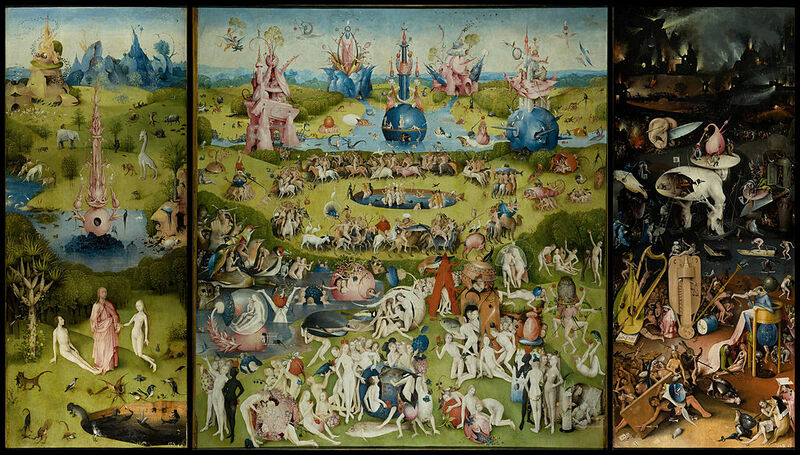 The Garden of Earthly Delights in the Museo del Prado in Madrid, c. 1495–1505, Hieronymus Bosch. Some Christian theologians identify spirit and soul as a single element of the human being, in a duality with the flesh, or material body. This spirit or soul is the inner, intangible, immortal substance that leaves the body at death to soar to a spiritual paradise called Heaven ruled by a disincarnate Jesus, or descend to a tortuous underworld called Hell ruled by the devil. 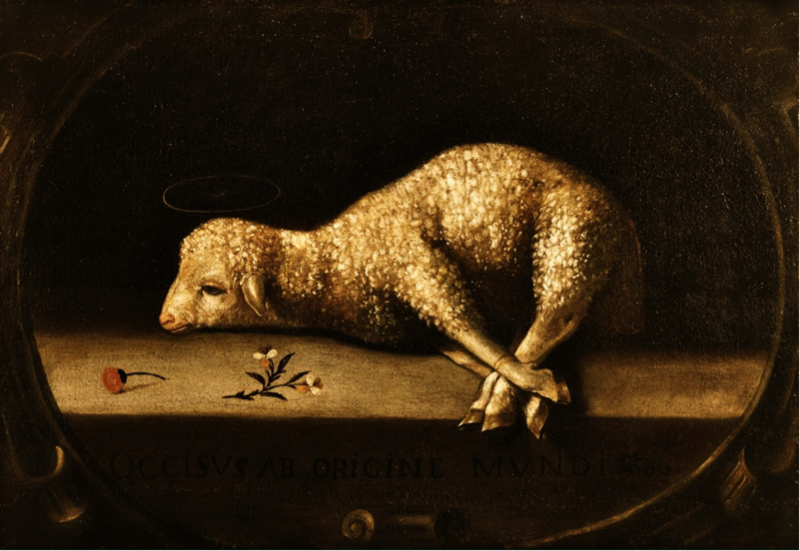 Some claim that the afterlife described in the Gospels is allegorical, which is the likely explanation from the perspective of modern science and critical thinking. A life of compassion and ethical behavior is an eternal reward in itself, whereas a life of sociopathic narcissism and crime is a punishment that lasts forever. 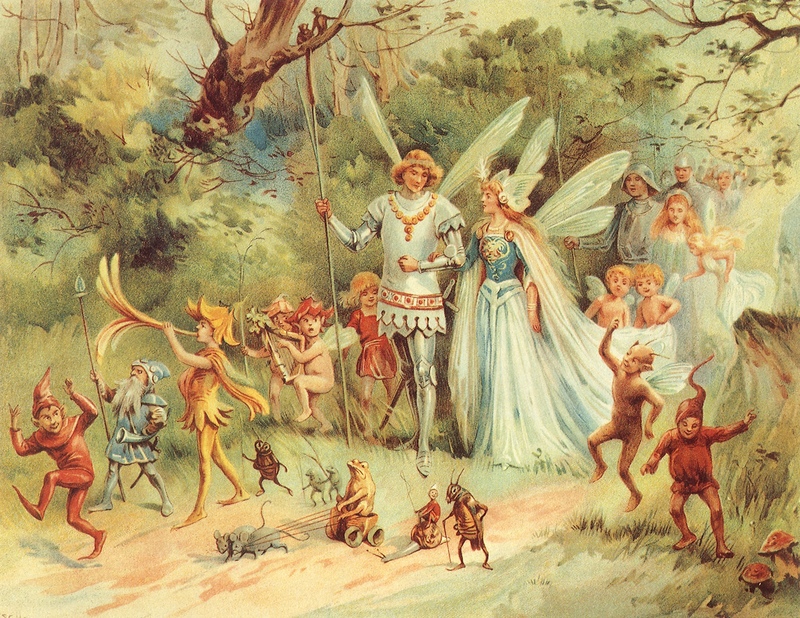 A “spirit” may also mean a force in nature, equivalent to a god or more specific in character. In this sense a spirit is simply an archetype, such as the spirit of love, the spirit of the sun or the spirit of the laws. The religious concepts and terminology of “divine” or “spiritual,” referring to the gods or forces of nature which rule over the temporal things, may be dismissed, unless aligned with natural law, as a reference to ideal things as a purely psychological set of phenomena. Evidence does not suggest the existence of life-force as a tangible thing. The concept of life-force may be nothing more than a mental construct to account for various essential elements of a healthy and enlightened life or state of mind. Defined as such it is useful in visualization leading to meditation. But Scientists Are Searching For It. Psychologists such as Kenneth I. Pargament and Jeremy McCarthy regard spirituality as “the search for the sacred,” the sacred in this sense meaning anything that is deeply meaningful in a subjective way. This makes spirit an emotion of fulfillment as well as a connection to the greater whole. 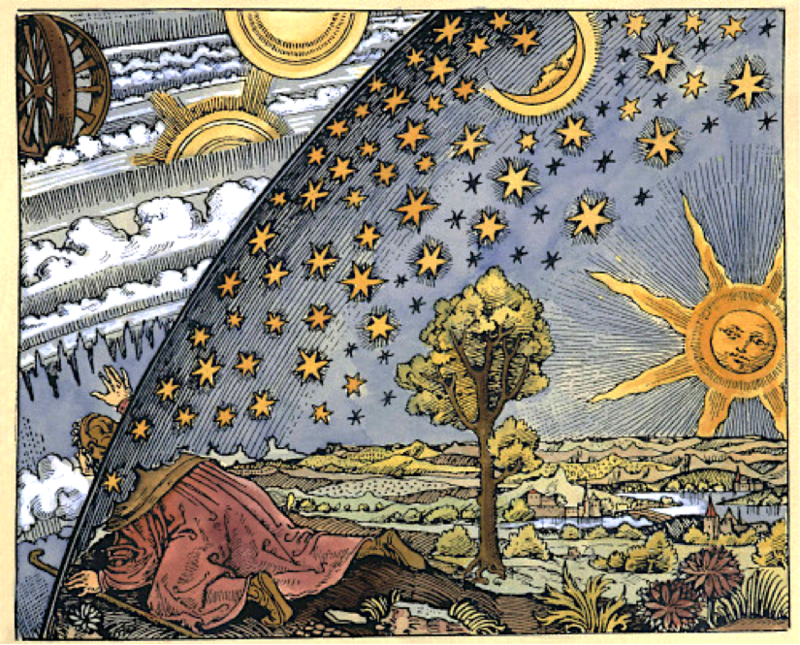 Alchemy, the precursor of science, was centered on the operations to purify and cultivate spirit. The alchemical “Spirit” refers to the primordial life-force generally imagined to reside in the air and the breath of all living beings. The Chinese word is qi, the Indian yogic term is prana, the Hebrew is ruach, the Common Greek is πνεῦμα (pneuma), the Latin is spiritus, and the French is élan vital. Alchemy ascribes this force to Mercury or Quicksilver, the quintessence of the natural elements, the cultivation of which culminates in pure consciousness and enlightenment, the Philosopher’s Stone. Sir James George Frazer, The Golden Bough: A Study in Magic and Religion, Macmillan & Co., New York, London, 1894. Not in Copyright.